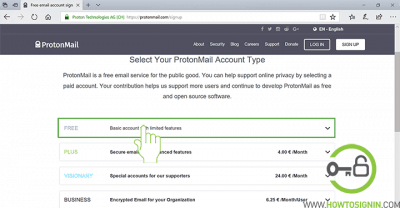 If you are concerned about the privacy while using any service from any email service provider, then Protonmail is the best option for you. Protonmail uses client-side encryption to protect user data before they are sent to its server. Protonmail is so concerned about the privacy of your client that they even the alternative password and your phone number is not compulsory. You can quickly create ProtonMail for free either by using a web browser or mobile application for android and IOS. However, for more secure with customized advance features you got to use paid ProtonMail plus account. 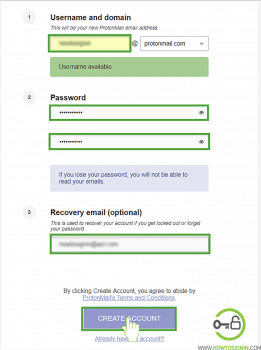 Step 2: Click on “Sign up” or “Get your Encrypted email Account”. Step 3: You will see different plans offered by Protonmail; click on the downward arrow at the end of the Free plan and then click on “Select free plan” option. Select username that you want to keep as email id of your ProtonMail. 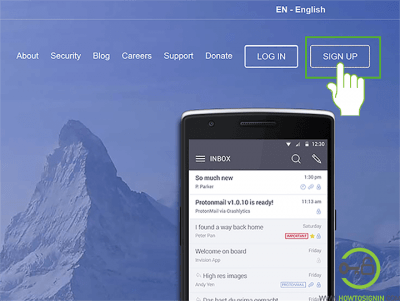 For you are from Switzerland, then you can even choose different domain “protonmail.ch” if you prefer. 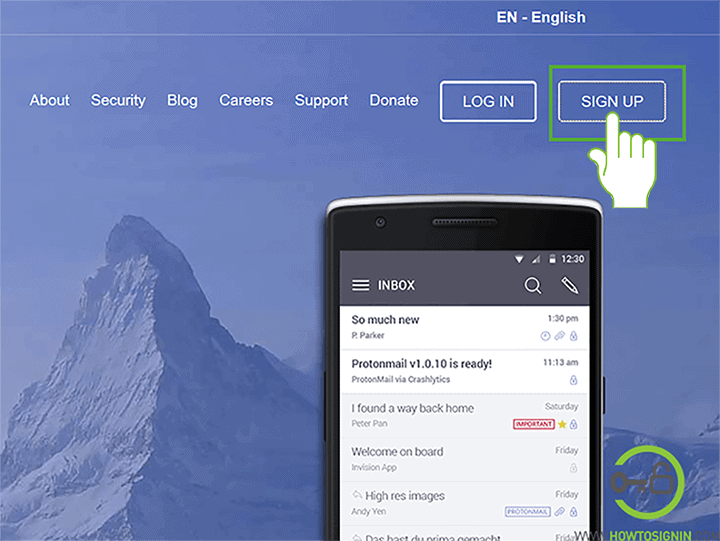 Input the password which you must enter while accessing your ProtonMail account. Keep password in such a way that it is easy for you to remember and difficult for others to guess. Make use of different case alphabets, symbols, numbers while creating the password. As there is no place to enter the mobile number and alternative email id is optional, so there are no means to recover the password in case you forget it. Therefore, make sure that you keep the password that is very easy for you to remember. Re-enter the password to confirm the password. Though there is a place to enter an alternative email address, it is not a compulsory field. If you think you are too bad at remembering a password, then is recommended to provide an alternative password. Step 5: After entering all the required credentials, “Create Account”. Step 6: Now to confirm that you are human you will be asked to verify your account either by “Email”, “SMS” or “Donation”. You can choose any one of the options. However, in case you choose email or SMS, the email address or mobile number will not be linked to the ProtonMail account. Step 7: Enter the verification code sent to email or SMS and then click “Complete Setup”. 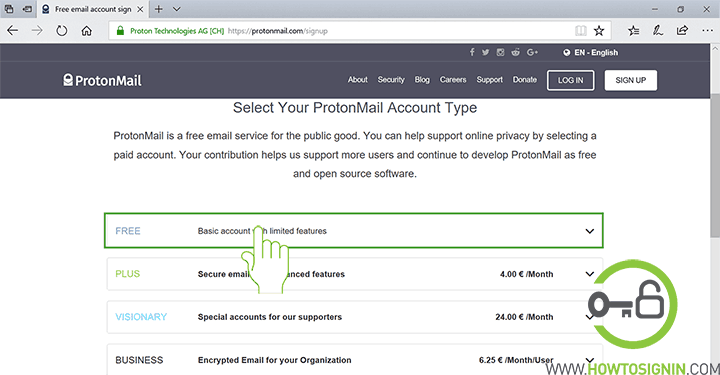 Step 8: Finally, your encrypted email account is ready, click on “Finish” start using proton mail to send and receive secure email and contribute little in the secured online email campaign. Open it from your mobile’s menu. Tap on “Create Account” on the home screen of the app. Now, select the plan that you want to use. Since we are talking about the procedure to create free ProtonMail account tap on “+” sign that lies at the end of the box under title “Free” and then tap on “Select” from the sub-window that slides down. Type the username that you want as your email id, if the username is not already taken only then you can continue further. If you want to choose different domain then tap on downward facing arrow just after @protonmail.com. And tap on protonmail.ch. Create a password that is strong enough. Make the use of upper case & lower-case alphabets, numerical and symbols to make your password strong. But at the same time keep in mind that password should not be so difficult that even you can’t remember them. Re-type the password to confirm. You cannot recover the password in case you lost them so keep password that you don’t forget easily. In ProtonMail, you can choose the level of encryption to be used. High security of 2048 bit is the current standard if you want the extreme security of 4096 bit, tap on the small box before Extreme Security and then click on Continue. If you choose extreme security, it takes a bit more time to setup and even receive and send emails. Select the mode of verification. Either email or phone verification shall be chosen but be confirmed it is necessary just to verify that you are human, and email or phone number will not be linked to your ProtonMail account. Type the verification code sent to the medium you have selected and then tap on Complete Setup. Finally, ProtonMail sign up process is complete. You can access it through your mobile application or web browser.